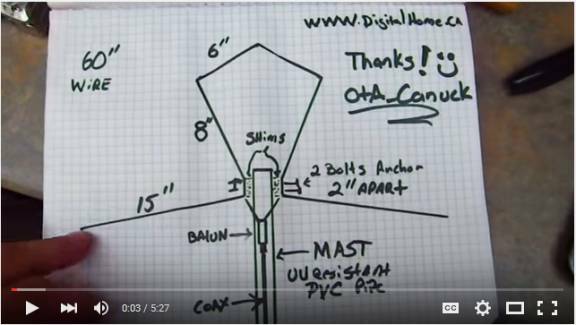 Earlier this month, March 2016, a fellow ham radio operator who is also interested in UHF TV antennas, contacted me to tell about his experiments with his Pennyloop antenna design. His site is, http://www.pennyloopdesigns.com and you can buy his plans for less than $5. For those of you who do not know, a pennyloop antenna is an antenna based on a full wave loop antenna. It is basically a single loop antenna that is made out of some conducting material that starts out as slightly longer in length than the longest wavelength you want to receive. It is then bent into a loop and is vertically mounted and fed either from the top or the bottom. The Vertical position of the antenna is important. People who have played with the pennyloop have discovered, just as people who play with a single, or multiple, element bowtie have discovered, that the vertical position of the antenna is critical to good reception and it may not be the same for every station you want to receive. This means that more elements vertically positioned will help receive more of the stations you want to receive. Also, a good vertical positioning can increase the gain for some stations. 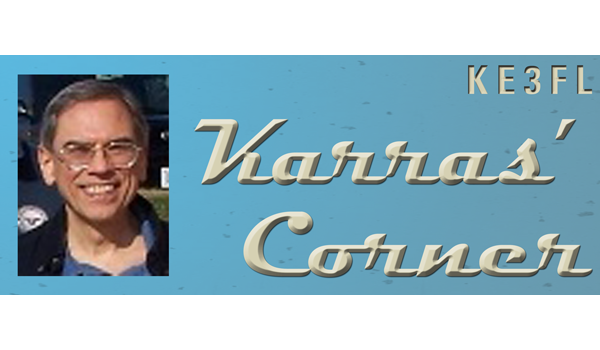 Unfortunately, the converse is also true, changing the vertical position of the antenna may well decrease the gain, signal level, of other stations. 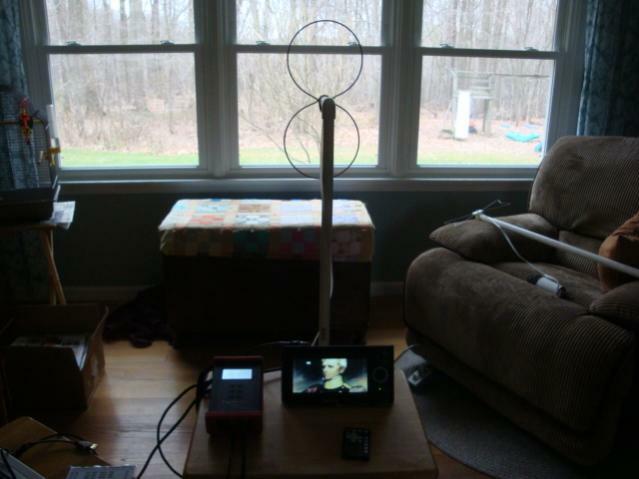 That said, here is a photo I have of the pennyloop antenna I was testing against my standard bowtie antenna. Please note: I have two standard bowtie antennas – one was a pre-DTV UHF bowtie antenna that came with a TV I acquired. Each side of this bowtie is 6.5″ long. The other is made from coat hanger wire, 16″ long bent in half with the ends three inches apart. The length of a single section is then eight inches and the overall length of the bowtie antenna is then 16″, plus a little for the distance between the connection points of the antenna. On the small table on the left is the Digiair DTV Signal Analyzer, and on the right is the small DTV so I can judge how well the signal is being received. 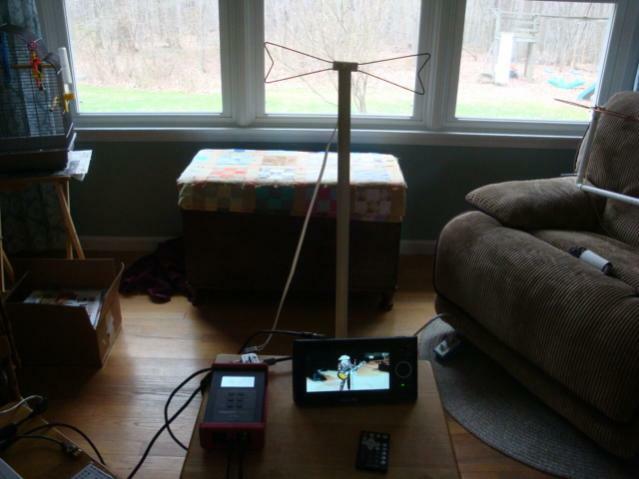 The antenna is parallel to the three living room windows so that it is picking up mostly signal to the southeast, south, and south west which should get some Baltimore and Washington DC stations. The first day of testing I did not use the TV, only the DTV signal analyzer. On both days I only looked at the signal levels as measured in dBuV, dB microVolts. On the first day, it was obvious that the two antennas were much the same as far as signal levels and stations received. There were differences and these may be important to you. After all, if the bowtie picks up channel 11 well and the pennyloop does not and you have channels 11 and 13 at your location, as I do, then perhaps building a simple bowtie would be a good option. On the other hand, if you have higher UHF stations, as most of us do now (such as 42 and 50), then it looks like the pennyloop is a better option. 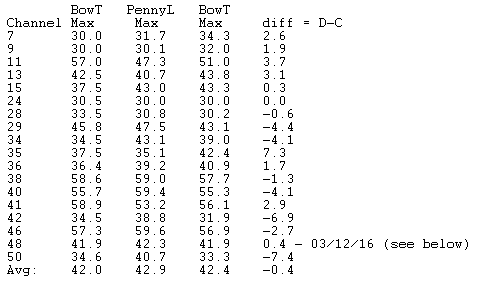 Here we see that the average gain is 1.6 dBuV for the pennyloop antenna vs the single bowtie. If we use just the UHF frequencies/channels available, then the gain is 2.7 dBuV, almost 3 dB better than the single element bowtie. One could argue that we should be using a two-element bowtie for comparison, but that’s not the point. The point is to see what any antenna does when compared to a single element bowtie so we can see if there is gain and, if so, where is it. This test has some flaws. The ones I can see are that if the conditions have changed then perhaps if I moved the bowtie up or down a bit, the gain would return to the previous day’s 0.4 dBuV. The other major flaw is that the tests are dependent on various conditions: water on the ground, dry ground, rain/snow/fog, leaves on trees, and various reflections of the signals. Many of these conditions are simply unknown. I will run these tests again, along with tests on the two and four-element bowtie antennas, so we can see what gain they have over the single bowtie. In previous tests of the quad-bowtie vs a single bowtie, the gain was obvious in the UHF area, and the VHF tended to have negative gain, meaning the single bowtie received these stations better. This makes sense, since the more elements we have spaced and made for the UHF section, the better it should receive the UHF stations and the less well the antenna will receive the VHF stations. So, the next set of tests will be taken on the Mt Airy ridge from the school lot where I did my previous tests. Until next time, I wish you good DTV-watching conditions.